Arsenal came out stronger in their FA Cup game against Watford but failed to take advantage of the chances at offer. Gabriel Paulista was at heart of the action when he got away without even a yellow card with his two footed lunge. The game was still 0-0 as both teams went into the break. Watford became more dangerous and put Arsenal under more pressure towards the end of the half. Ighalo finally broke the deadlock to put Watford 1-0 up. 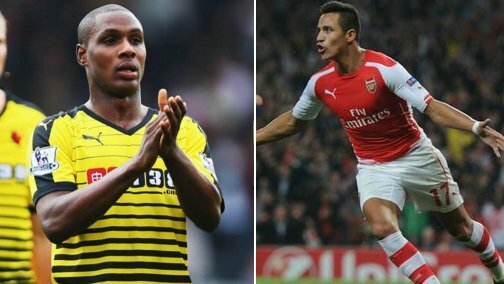 Goals from Odion Ighalo and Guedioura in second half gave Watford a 2-1 win over Arsenal as they reach semifinal of the 2016 FA Cup. Welbeck was on target for Arsenal in 88th minute but it was too little too late. Paulista should have see a straight red for his two footed challenge but he got away even without a yellow card. Arsenal need all to do in second half to keep their FA Cup unbeaten run going since 2013. Odion Ighalo was on target just after the break to put Watford 1-0 up in 50th minute. Arsenal were left shell-shocked when Guedioura put second past Arsenal. A late goal from Welbeck and a easy miss followed made the last 3 minutes of the quite interesting. Arsenal Watford will kickoff at around 1:30 pm uk time and BT Sports will have live coverage of both Arsenal-Watford and United v West Ham games on Sunday. We will have live links before the game plus match highlights immediately after the match is over. Watford vs Arsenal Preview: Arsenal defeated Hull City in the replay of their fifth round FA Cup game in midweek and that was their first win in since February 14th. Before the win against Hull City Arsenal went 5 games without a win which inluded 2-0 loss against Barcelona and back back league defeats against United and Swansea which put them 8 points behind Leicester in the title race. Last time Arsenal meet Watford was back in October 2015 when goals from Sanchez, Ramsey and Giroud earned a comfortable 3-0 win in premier league. Arsenal will have Mertasacker and Gabriel fit to start the game while Nacho Monreal and Hector Bellerin should keep their places as fullbacks. Coquilin and january singing Elneny to anchor the midfield while Walcott, Ozil and Sanchez to play in attacking roles behind Olivier Giroud who scored two goals against Hull City in midweek. AS far as Watford is concerned they will keep their full strength lineup with Ighalo and Deeny to play upfront whil Abdi, Capoue, Behrami and Watsom to start in four man midfield. Nyom, Nathan Ake, Prodl should start while their are question marks about Cathcart fitness. Match Predictions: Watford has a full squad to choose from and all the players are well rested ahead of FA Cup tie. They will be looking to emulate Swansea City who defeated Arsenal couple of weeks ago at the emirates with a physical game. Arsene Wenger might have one eye on the midweek Champions League game against Barcelona and i he rest couple of main players Watford will fancy their chances. However i am going with a 1-0 win for Arsenal who has been unbeaten in FA Cup since 2013.